Even so, Mr Xi’s authority remains hemmed in. True, his position at the highest level looks secure. But among the next layer of the elite, he has surprisingly few backers. Victor Shih of the University of California, San Diego, has tracked the various job-related and personal connections between the 205 full members of the party’s Central Committee, which embodies the broader elite. The body rubber-stamps Mr Xi’s decisions (there have been no recent rumours of open dissent within it). But the president needs enthusiastic support, as well as just a show of hands, to get his policies—such as badly needed economic reforms—implemented. According to Mr Shih, the president’s faction accounts for just 6% of the group. That does not help. Admittedly, this number should not be taken too literally: it is difficult to assign affiliations to many of the committee’s members. Doubtless, too, many members who are not in Mr Xi’s network support the president out of ambition or fear. Still, Mr Xi can rely on remarkably few loyal supporters in the Central Committee because he did not choose its members. They were selected at the same time he was chosen as party leader in 2012, a process overseen by the dominant figures of that period, Mr Hu and the long-retired Mr Jiang. That China’s rulers, at least since the late 1970s, have not been totally unaccountable. The country is a dictatorship by committee. And a large committee at that. It is not a personalist one man show. The the Chinese party-state works tirelessly to reduce the cost of compliance among its citizens — through conscious state building, coercion, and public services. What this means is that in order to replicate China’s autocratic success, would be little Chinas must invest in both state capacity and intra-elite accountability (perhaps by building strong, institutionalized parties). Absent this, what you are likely to get are mediocre petty tyrants running disorganized non-states with infant mortality rates straight out of the 16th century. ….. Shanghai has a particular problem: last year, says China Daily, it became the first city in China to pass the crippling 30 per cent mark for population aged over 60. That’s nearly twice the 15.5 per cent for over 60 population nationally in 2014, the last year for which national figures are available. That is a lot of senior citizens. For more see this FT piece on how the state in China is trying to force children to take care of their aging parents — including using threats to deny them library access, credit, and bank accounts. The bulk of Ugandan government borrowing against future oil revenues has focused on grand infrastructure schemes built and funded by the Chinese. In 2014 alone, the government signed deals with China to build two hydropower dams worth $2.2 billion, a standard gauge railway that could cost up to $8 billion, and a $600 million fertilizer plant. Additional projects include a $2 billion oil field being developed by the state-owned China National Offshore Oil Corporation and a $350 million roadbetween Uganda’s capital, Kampala, and Entebbe International Airport. The possibility has even been raised that a Chinese bank may bail out Ugandan parliamentarians in danger of going to jail for failure to honor their debts. And how efficiently is Uganda spending the [expensive] borrowed money? So what will happen when China decides to deal with its public debt situation and the effects propagate to its many public companies involved in mega-projects in Africa? 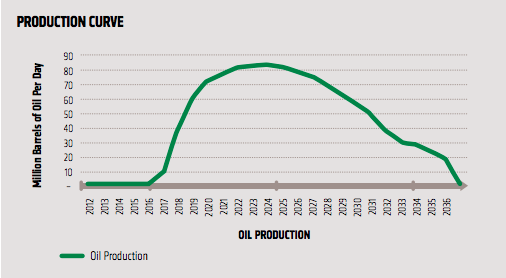 To reiterate, let’s not declare mission accomplished in the war against the resource in Africa just yet. May be it is just because my adviser at some point studied the politics of language and identity (see here and here), but this morning over breakfast as I was watching the newly elected appointed successor of Hu Jintao as president of China give his inaugural speech to the press I was reminded of the continued soft (and hard) power of the English speaking North Atlantic world – or just simply the US. In my opinion, it says a lot that the Chinese authorities felt the need to have a translator in the room, and for Mr. Xi Jinping to wait after every paragraph or so for the English translation to go through (they may have had translations to other languages as well, I was watching it live on the BBC). Imagine the day when a newly elected US president, standing on the steps of the Capitol, gives a speech in English but has to wait every now and then for a Mandarin Chinese translation to go through. Language is very central to human interactions, and whoever has power over language usually has a lot of sway (as is argued in the books above). This morning someone won the politics of language. And it was not Beijing. 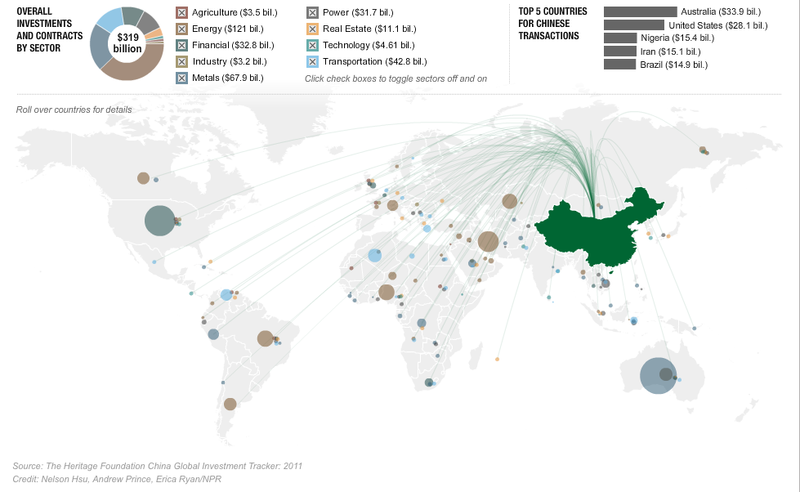 NPR has this cool graphic on China’s global investments [click on image to enlarge]. Notice that Nigeria is among the top destinations of Chinese investments. In my alternate universe Abuja (the undisputed regional hegemon) is stable and uses this, and the fact that it is also among the most important sources of US-bound crude oil, as leverage to nudge the two biggest global powers in the direction of a more stable and coherent Africa policy. The ambiguities in China’s relationship with Africa have created fertile ground for politicians. Opposition parties, especially in southern Africa, frequently campaign on anti-China platforms. Every country south of Rwanda has had acrimonious debates about Chinese “exploitation”. Even in normally calm places like Namibia, antipathy is stirring. Workers on Chinese building sites in Windhoek, the capital, are said to get a “raw deal”. In Zambia the opposition leader, Michael Sata, has made Sino-scepticism his trademark. Much of this is wide of the mark. Critics claim that China has acquired ownership of natural resources, although service contracts and other concessions are the norm. China is also often accused of bringing prison labour to Africa—locals assume the highly disciplined Chinese workers in identical boiler suits they see toiling day and night must be doing so under duress. Even so, the backlash is perhaps unsurprising. Africans say they feel under siege. Tens of thousands of entrepreneurs from one of the most successful modern economies have fanned out across the continent. Sanou Mbaye, a former senior official at the African Development Bank, says more Chinese have come to Africa in the past ten years than Europeans in the past 400. First came Chinese from state-owned companies, but more and more arrive solo or stay behind after finishing contract work. Many dream of a new life. Miners and builders see business opportunities in Africa, and greater freedom (to be their own bosses and speak their minds, but also to pollute). A Chinese government survey of 1,600 companies shows the growing use of Africa as an industrial base. Manufacturing’s share of total Chinese investment (22%) is catching up fast with mining (29%). That is the Economist reporting on the ever-growing Sino-African relationship. The main takeaway point is that Africa is increasingly becoming a manufacturing base for Chinese companies. With that comes transfer of technology, development of local expertise, increased competition and exposure to what’s happening outside the continent. In a few decades Chinese labor will get too expensive to support a robust export-oriented economy. That, coupled with increased domestic consumption in China will provide a good chance for African countries to finally begin their own move towards export-oriented industrialization and service provision.